If this unit is within eight hexes of an enemy unit and has line of sight to it, friendly Aircraft roll one extra attack die when attacking that unit. This unit only counts as a Spotter if it doesn't move in the assault phase. While this unit has cover enemy units can’t attack this unit at long range. Q: What units are considered to be Spotters? A: Any unit with the Spotter special ability. 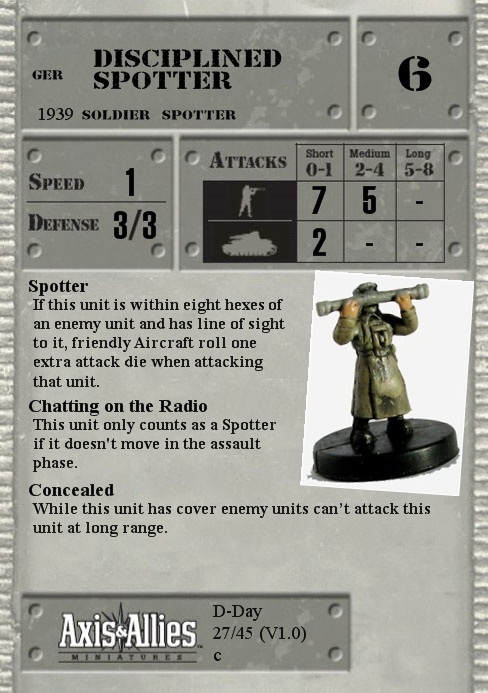 There are also some units that have the subtype Spotter like the US Ranger (Soldier-Spotter). A unit with the Improved Indirect Fire SA can use any spotter including the US Ranger even though it doesn't have the Spotter SA. Q: Can a US Ranger give Aircraft the Spotter bonus? A: No. Rangers are Soldier-Spotters but don't have the Spotter special ability that gives Aircraft the attack bonus. Q: Can the US Ranger spot for indirect fire units both before and after it moves in the assault phase or only if it doesn't move during the assault phase? A: Because the US Ranger doesn't have the Chatting on the Radio SA, it can move and then spot or spot and then move. Q: Are Commanders considered to be spotters? A: Only artillery with the Improved Indirect Fire special ability allows a Commander to spot for it. So unless the SA of artillery specifically states it, the Commander can't spot for artillery. Q: Can a Spotter provide the aircraft bonus to Aircraft attacking other Aircraft? A: According to the 11/12/09 Rules Update; this special ability provides a bonus only for attacks against Vehicles and Soldiers. Q: What if a spotter is looking at a target's rear, but the artillery is in the front arc? Does the indirect artillery hit the front or rear defense? A: Whether you hit the front or rear of a target depends on the facing of the target to the artillery unit. A spotter doesn't change this. It only allows the artillery unit to ignore line of sight. Q: If I use Rockets or Bombs on an enemy unit and I have a unit with the Spotter SA that is within eight hexes and has line of sight to the target do I get to roll an extra attack die for the Rockets or Bombs attack? Q: Can a Spotter be used to spot for Aircraft and Indirect Artillery in the same phase? Q: So a unit with the Chatting on the Radio SA can't move if it spots and can't spot if it moves. But what about spotting either before or after it performs an attack in the assault phase? A: Attacking has no effect on spotting. Q: A spotter can't move if he spots in the assault phase and can't spot if he has already moved. But what happens if the spotter is a passenger in a Vehicle with the Transport SA? Can the Transport move and then the spotter spots or vice versa? A: Yes, that is allowed because the spotter himself did not move. The Transport he is sitting in does the moving, he just along for the ride. Q: Are US Rangers with their Soldier-Spotter subtype supposed to suffer from the Chatting on the Radio limitation of not being able to move if they spot? A: No. US Rangers don't have the Chatting on the Radio SA. Q: Does "has cover" mean that the unit must succeed at a cover roll to get the Concealed ability? A: No. A unit "has cover" just by being in hex filled with defensive terrain. This means that a unit with the Concealed special ability can't be attacked directly at long range while it's in a forest, hill, marsh, town or other hex that gives a unit cover.